Time once again to leap on over to WordPress and discover that the theme for their weekly photo challenge is free spirit. I nominate my middle child to be my representation of a free spirit. 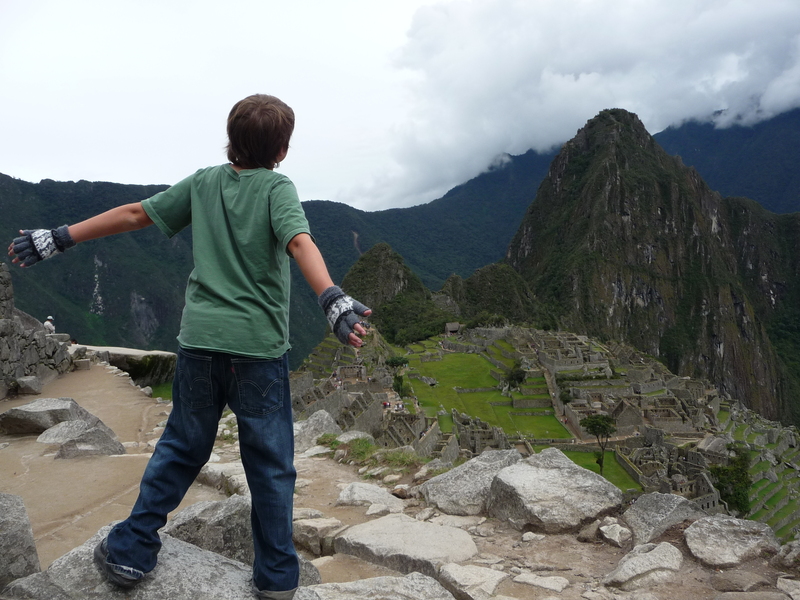 Along with the pose above, our middle child would yell out the phrase, “Feel the kingdom!” He did this pose and yell at various stops along the tour much to our delight (I can’t speak as to whether the other folks walking around Machu Picchu were delighted…but they should have been). To my middle child…may he always allow his free spirit to be heard. For a day – and thankfully on a weekend – the winter sky of Lima threw off its usual grey cloak of clouds and decided to let the sun make an appearance. Well, to be honest, I have no idea if the seaside portion of the city or if the historic downtown section of Lima received sun. All I know is that our district of the City of Kings saw Sol and that’s good enough for me. To celebrate this wonderous occasion of seeing our solar system’s star in the sky, I took our daughter to our neighborhood park – the one that was recently renovated. We started off our park stay by enjoying a quick snack of fried dough. Now, a vendor of churros and yuquitas doesn’t want to put any old image on their kiosk to attract attention. 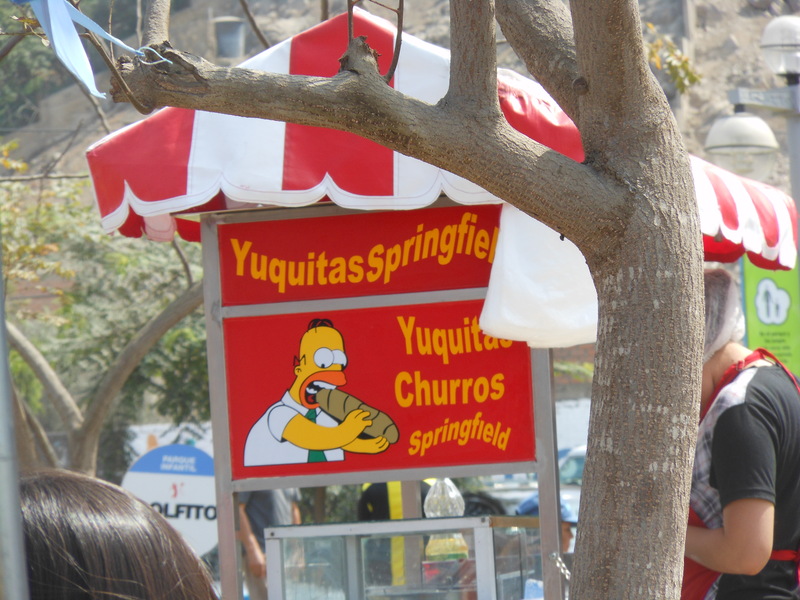 No, this is Peru and as I have written before, The Simpsons are big in Peru so this cart selling fried dough was no surprise. Our park contains a variety of play equipment for the little ones including those devices that kids can sit on and bounce back-and-forth (oh, I’m sure they have a real scientific name), slides, hopscotch courses, and a mini-golf course. 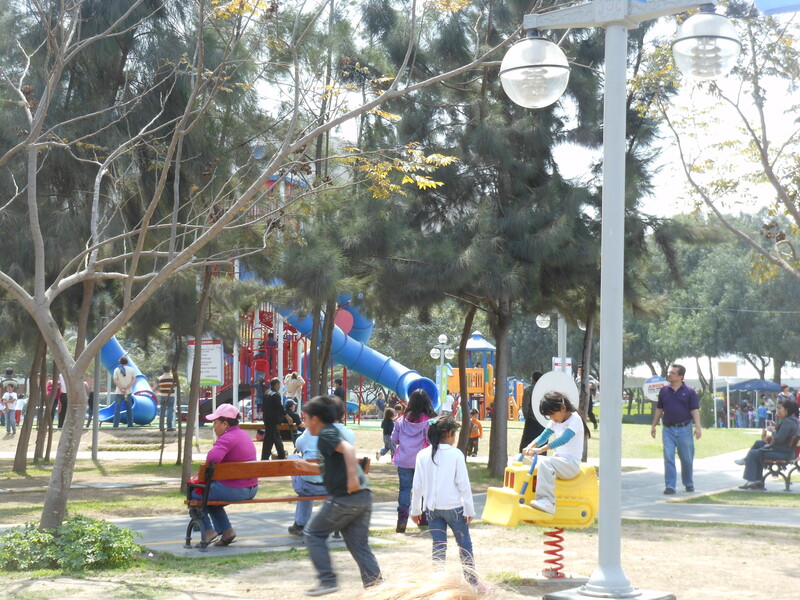 On weekends, the park also contains stands for other things for kids to do. 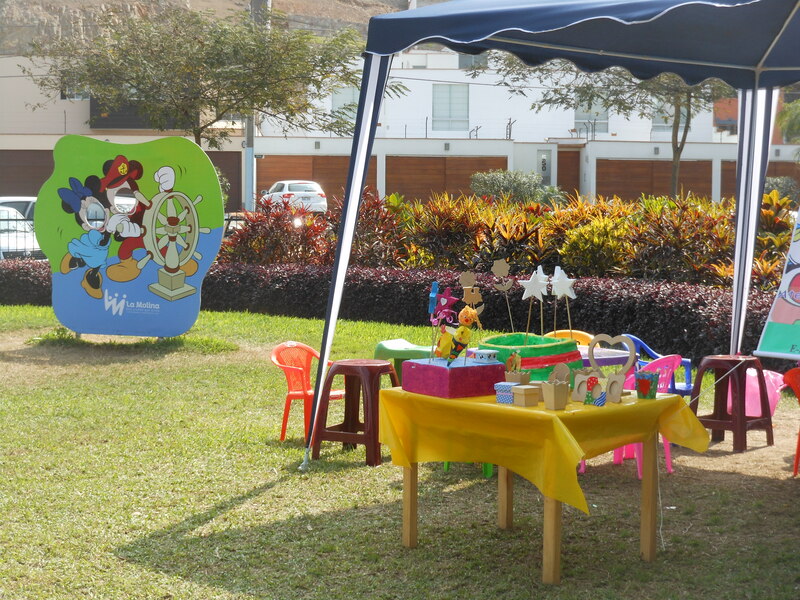 There is a face-painting kiosk (a bit hit with our daughter), a table for children to do origami, and (below) a place to make some crafts. Mickey and Minnie say “hi”. Our daughter took this opportunity to flex her creativity. 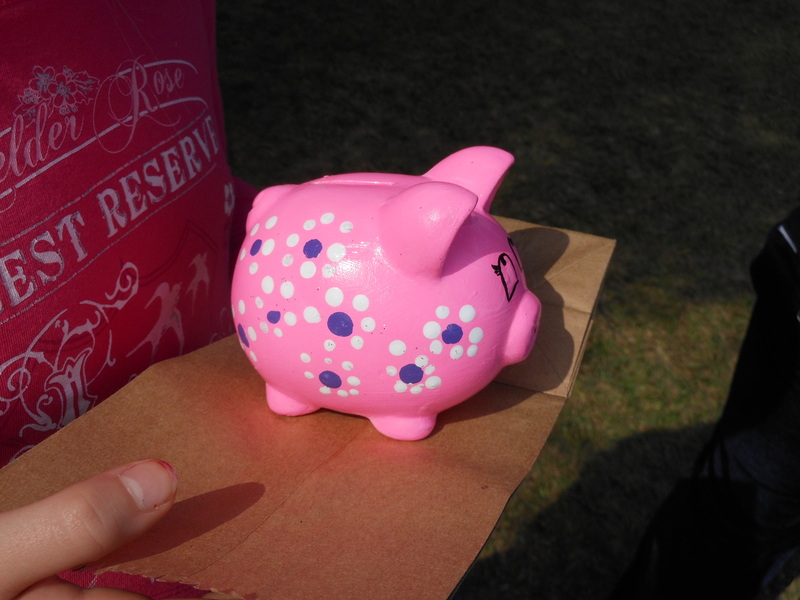 At the arts table, she painted a piggy bank for herself where she can house the few nuevo soles that she has. All in all, a wonderful way to spend a winter day in August. What could be thought of as the polar opposite of Photo Friday’s theme of “quiet” (my response here), WordPress has offered up theme of “urban” for their weekly photo challenge. The streets of Lima and its surrounding districts are chock full of tiny kiosks that sell all manner of snacks and drinks. 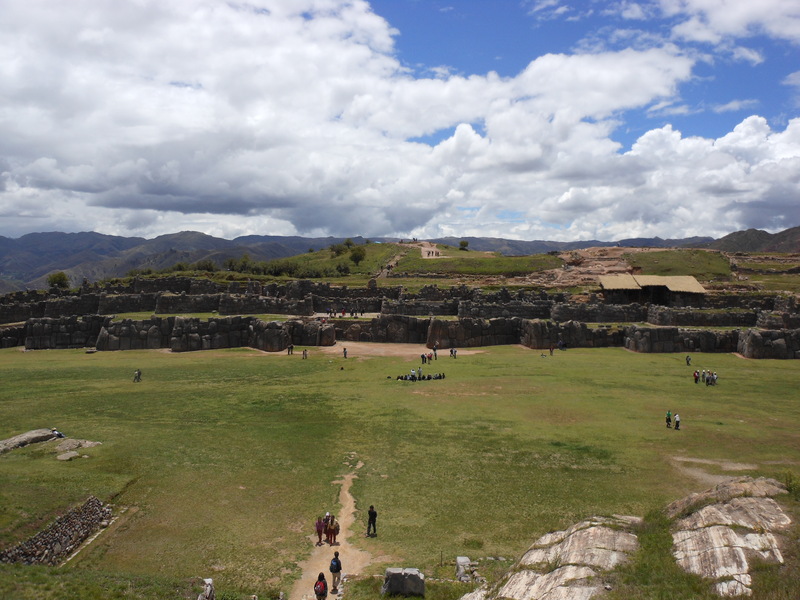 For a few nuevo soles, a pedestrian can pick up an Inca Kola and a Sublime chocolate bar. However, the vendors of Lima are quite thoughtful and carbonated beverages and sweets are not the only items sold on the avenues. For those business folk and other residents who find themselves walking down the street and realize that they need a pen, pencil, or a pad of paper, this person can help you out. 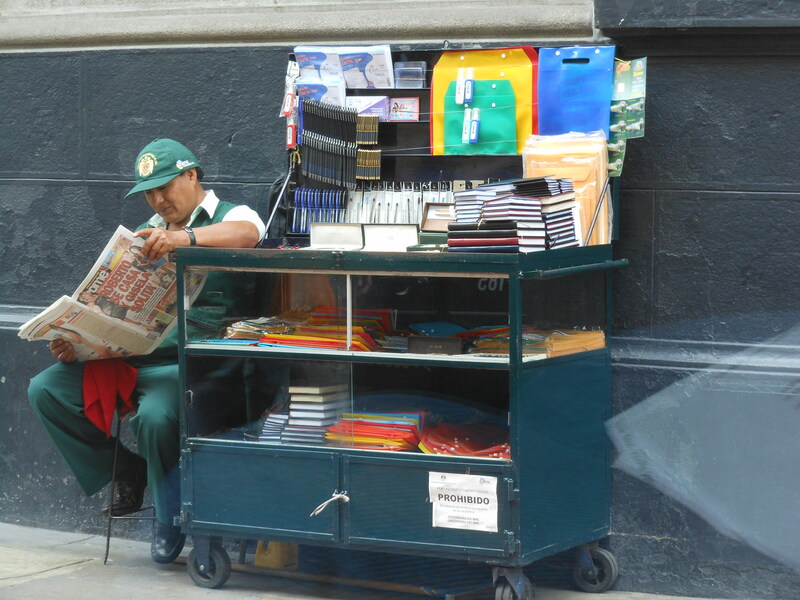 A street-side office supply store. This is a great town. Graph notebooks are available for sale also. I do this because I live in a Spanish-speaking country and charades only get me so far when I need to communicate with all manner of Peruvians. In almost over a year of taking classes on how to conjugate, how to understand the difference between ser and estar, and how to speak with the impersonal se, I now have two objectives when in class. The first is to learn how to speak better. The second is to attempt to derail the class. I do this by asking the teacher questions about life and culture in Peru. Usually, when I make my move to move the conversation away from our exercise book and into all things Peruvian, I have to come up with a clever segue to change the direction from conjugating in the past tense to the vacation habits of folks from Lima. Today, however, was a slam dunk as one of our exercises contained a bit of dialog where one of the actors said that (and I’m translating here) “Tuesday the 13th was a day of bad luck”. This prompted me to ask if it was true that Martes trece was a day of poor fortune and, if so, why was this. She could not explain why, but not only did my teacher confirm that Tuesday the 13th was indeed an unlucky day in Peru, but that it pales in comparison to the doom and gloom that comes with Sunday the 7th. 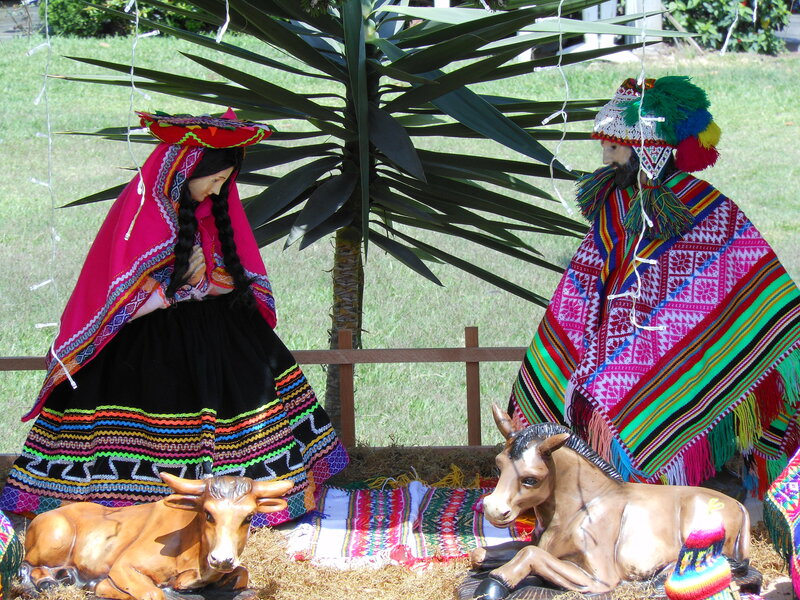 So bring out your good luck charms and mal de ojos to ward off the nasty spirits as this coming October sees a Sunday the 7th and November contains a Tuesday the 13th. 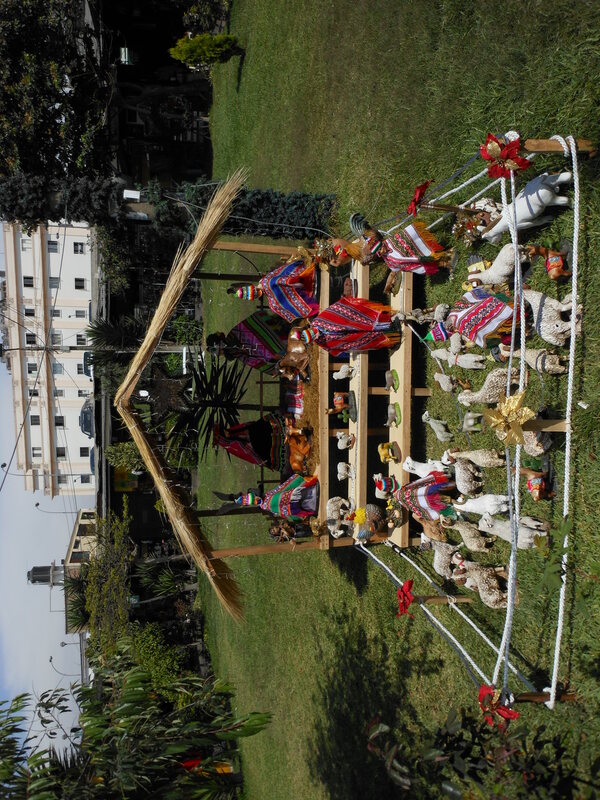 Today – August 19 – was celebrated in Peru as Dia del Nino (Children’s Day). Now, I’ll put aside the thought that every parent has at this moment that every day (except for Mother’s Day and Father’s Day) is children’s day and get on with the story at hand. In our household, we decided to honor this holiday by torturing two-thirds of our children. We did this by taking our kids to the ballet. The Ballet Municipal de Lima was offering up performances of Pyotr Tchaikovsky’s work The Sleeping Beauty. The one member of our progeny who enjoyed the show was our grade-school daughter who has done her time in a tutu at a ballet school and has even participated in a dance recital. She was excited about going to the show, but I did have to squash some of her expectations. She knew the story of Princess Aurora through the Disney movie, so I had to inform her that there would not be a Maleficent or a dragon-battling scene at the end. With that story clarification dispensed with, she settled in to enjoy the dancers leap, turn, and stand in all the five different traditional positions. As for our two boys, this attempt at culture was summed up by the sole descriptive word of “boring”. That’s too bad, because the ballet company will be performing Carmen in October and we will be going. Now I cannot take credit for placing this object where it should not belong. That dubious honor goes to my middle child. While kicking around a bouncy ball in our backyard on this Monday afternoon, he became a tad too rambunctious and booted it high into the air. Our yard is surrounded by high brick walls and every so often an object of play (ball, Frisbee, shuttlecock, etc.) would find its way over the wall and into one of our neighbor’s yard. Most of the time, those lost items wound its way back into our yard (we have pleasant neighbors even if we haven’t met them all), but there was always a lag in time between loss and recovery. As I watched the mustard-colored orb arc towards the wall, I closed my eyes not wanting to watch another object be lost for a while. 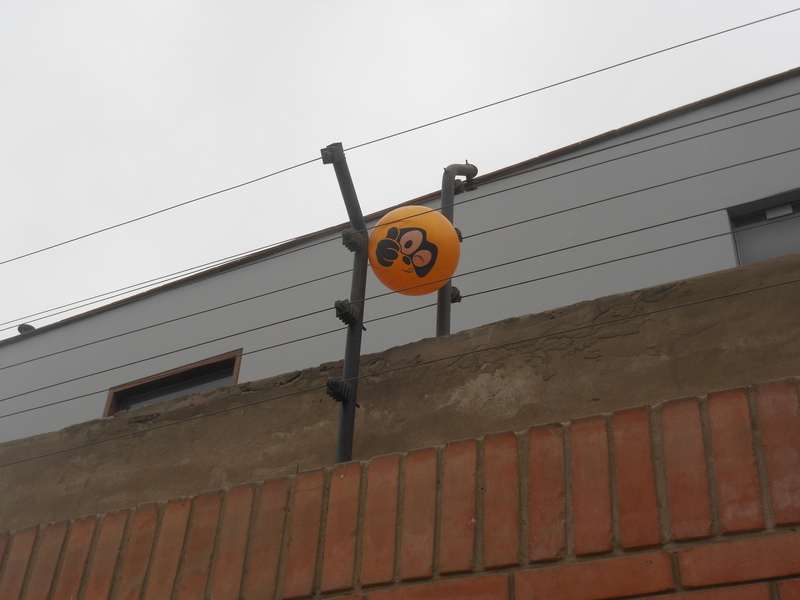 Yep, that’s an electric fence. This ball is most definitely NOT where it belongs. In a previous life, I worked as a software tester. My basic job description was to find errors and discrepancies in software applications that other people had worked on. My employment raison d’etre was that I (and others like me) would find the bugs before the actual users of the system would. With that as my background, I am always tickled when discrepancies make it through a company’s quality assurance process and wind up in front of the users. This predisposition of mine predates my employment in the information technology world as – way back when in 1983 – I wrote a letter to NBC News explaining to them that their globe in the opening credits of the nightly news program was spinning the wrong way. I received a lovely response (sadly, not from Tom Brokaw himself) from the folks at 30 Rockefeller Center saying they knew what they were doing and that their globe rotation was a version of artistic license. Their response was bogus as they did change the graphic in 1984. Back to this century and I could not help but laugh when I saw the student planners both of my boys came home with after their first days of school. These planners, provided by the School, are books and they are wonderful tools to help the kids organize their homework. However, there was a slight issue with the dates in the planner. If you take a moment at look at your calendar for 2012, you will notice that the second Monday in August is the 13th, not the 17th. August 17, 2012, lands on a Friday. Likewise, October 22, 2012, falls on a Monday, not on a Thursday. 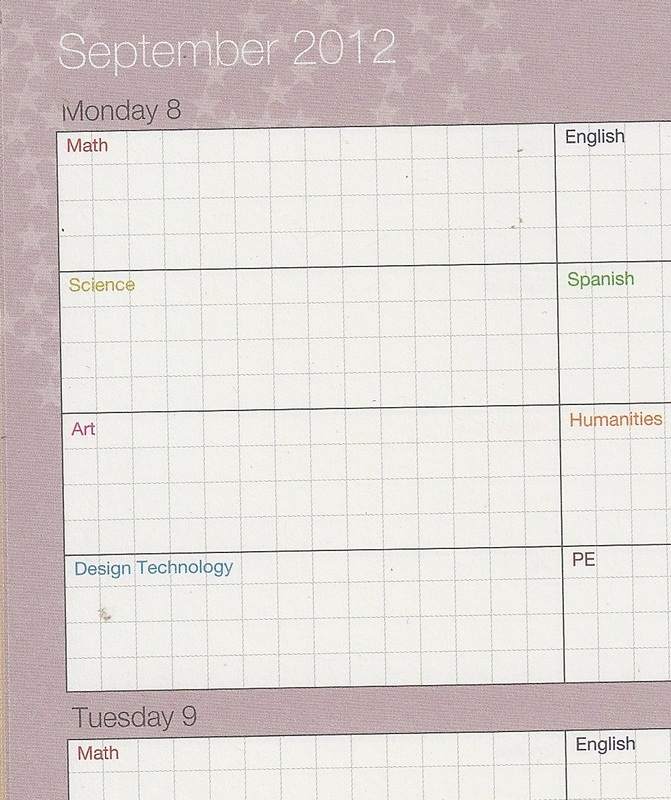 It appears that the School accidentally took the format from a 2009 calendar and pasted 2012 where the year would go. The eighth of the ninth month in 2012 is on Saturday, not Monday. The last time 9/8 was on a Monday was in 2003. 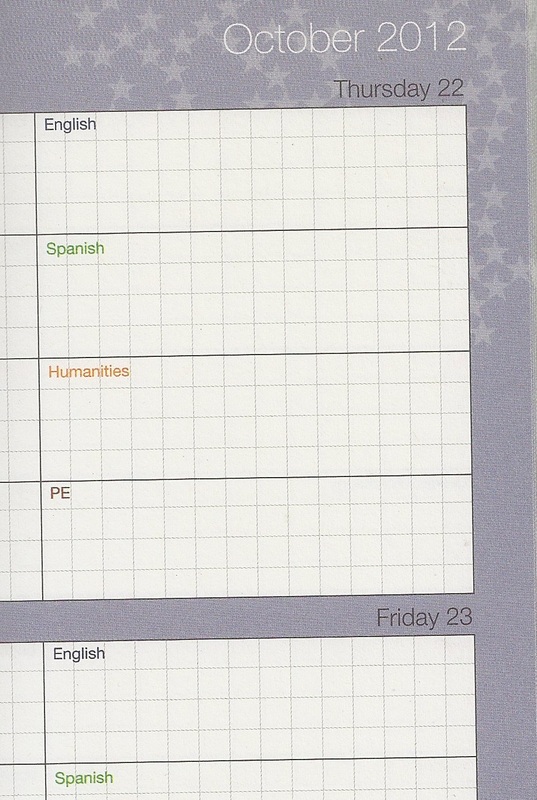 So it now appears that the School took two different calendar year formats and mashed them into a 2012 calendar. Someone over at the publishing company’s quality assurance department was asleep at the switch, which perhaps is a perfect opportunity for me to seek employment there. 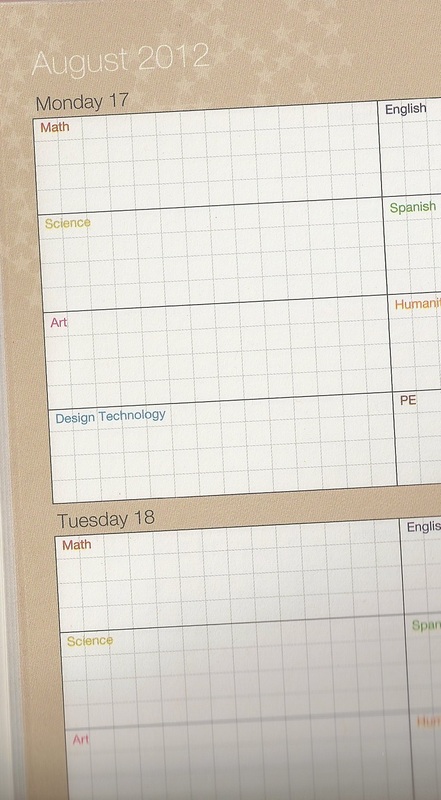 The end to this story is that the School requested that the kids return their planners so they can be fixed. I’m curious to see what the remedy will be and will it be easier or harder than making the globe turn the other way. You may not know this (I certainly didn’t) but August 13 is Left Handers Day, a day to celebrate all things left-handed. 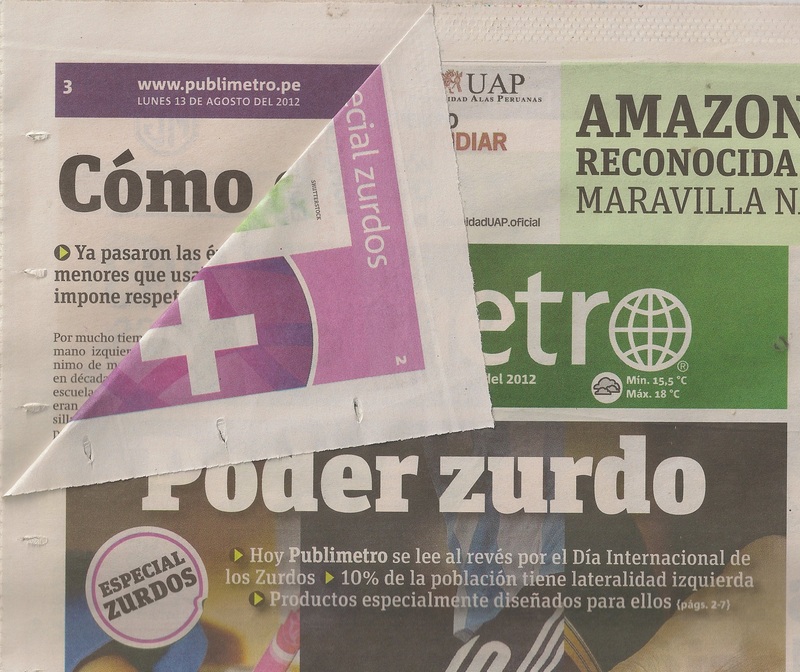 What you see above is the front page of Publimetro with the headline Poder zurdo. “Zurdo”, to the best of my knowledge, is the Spanish slang term for a left-handed person and it makes a modicum of sense. In English, a leftie is known as a southpaw. This comes from the fact that in most pre-1990 baseball stadiums, a left-handed pitcher would have his throwing arm facing south (The Straight Dope does a better job of untangling the origins of this term). In Spanish, “south” is sur, which, with a tiny change to the pronunciation, comes out as zur. As you will no doubt notice, to read the next page of the paper, you had to turn the left-hand side of the page. This is how the whole paper is laid out and it was quite the ingenious tip of the left-handed hat to ten percent of the global population. Inside, the paper had articles about famous lefties (soccer player Messi, President Barack Obama, singer/songwriter Paul McCartney) and products designed specifically for lefties (scissors, notebooks, keyboards, etc.). There was no mention of the left-handed Whopper.